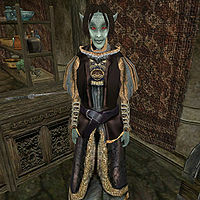 Dralasa Nithryon is a Dunmer pawnbroker who can be found in her shop in Balmora, located close to the southern town entrance. She has 700 gold, more than any other pawnbroker in Vvardenfell. She has a small array of assorted items to trade, most notably flin and Cyrodiilic brandy. She is wearing an expensive shirt, skirt and shoes and wields an iron club. She is also carrying respawning supply of apprentice's armorer's hammers. Aside from her natural resistance to fire and the sanctuary provided by her ancestors, she knows no spells. This page was last modified on 26 March 2017, at 07:34.